Publish a twice-yearly magazine with news and reports of events and with articles on all aspects of dance worship. This is sent to members for £10 a year. Plan and promote workshops and liturgical dance events and celebrations, often in conjunction with churches, cathedrals or other groups and organisations. 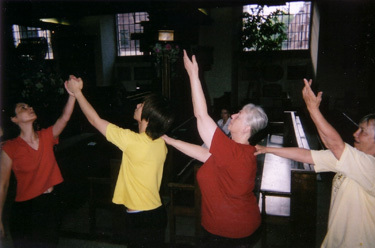 Recognise the traditions of danced worship in other world faiths. We dance as joint celebrators of life in its totality in the presence of the One, who in Jesus Christ has given that life to the Church. We are encouraged to develop such discipline, skill and imagination as will enrich and enliven both faith and worship. The dynamic of movement and physicality will enable our worship to become the offering of all that is human in a response to God's gracious gift. We welcome all those who come in a spirit of humility, exploration and uncertainty. We all have gifts to offer and we can all learn from each other.